Lions earn their moniker as king of beasts through efficient hunting and a lack of predators. One feature that puts them at the top of the food chain is their claws. These claws can grow up to 1 1/2 inches long and are sharp enough to quickly disable their prey. The main function of a lion's claws is to grab his prey. Sharp and ultra-strong, these claws dig into the skin of prey immediately upon contact. Instead of shredding the skin—although they certainly can shred when necessary—the claws are meant to grip and hold the prey, piercing through skin and muscle for a tight hold. This gives a lion time to get his mouth on the animal's neck for a quick kill. A lion has five claws on the front and four in the back—the extra front claw grasps prey from a different angle from the others, helping the lion hold on strongly. A lion's claws are specially adapted to be retractable, which means the lion can pull the claws into his paw to prevent them from getting broken when not in use. His claws are essential to his hunting tactics, so it's important to his survival to keep them in prime hunting shape. Keeping them inside his claws when he's not grabbing for prey helps keep them safe. They will grow back if broken in most cases, but it's in the lion's best interest to keep all his claws strong. 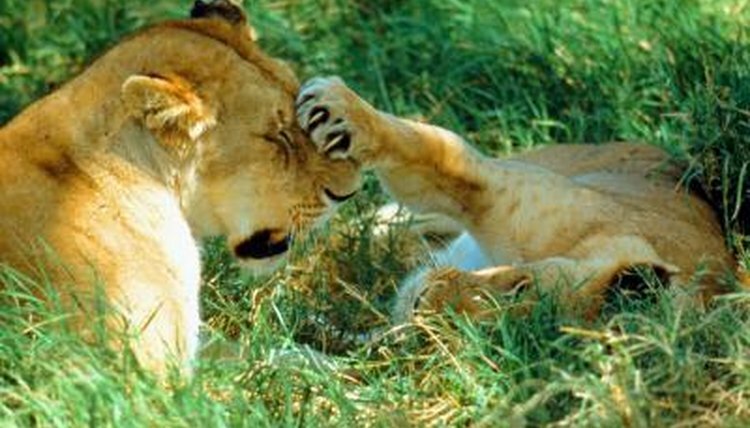 Lions tend to play and wrestle with their claws retracted, ensuring they don't hurt each other or break their claws by accident. While his claws find protection inside the paws, they've also adapted to help prevent breakage when exposed. Lion claws grow from the inside out, shedding the worn outer layers as new, stronger layers grow outward. This also helps keep the claws sharp, with a new point developing as the outer, and perhaps blunter, layer peels off. Retractable claws serve another function besides making sure the claws don't break: they also help the lion sneak up on prey. Without claws tapping on rocks as he walks or runs, a lion can move nearly soundlessly on his soft paw pads as he sneaks up on his quarry. A lion is well adapted for the sneak attack, and his ability to expose his claws in an instant and only when necessary is part of his plan.